The killing of Wani, who had a bright future ahead of him before he joined the militancy, is a grim reminder about how the decades-old conflict has been consuming young lives in Kashmir. Srinagar: In July this year, PhD scholar-turned militant Manan Wani wrote an open letter justifying his decision to join militancy. “…I did analyse wisdom of those in chairs, who wanted us to abandon our hope and work towards an exit from the conflict…it is also a response to elite people of Kashmir – the product of a fraudulent democracy, worst occupation and allegedly intellectualism,” Wani wrote in the letter sent to local news agency CNS. On early Thursday morning, 26-year old Wani was killed by government forces in an encounter at Satgund village of Kupwara. Wani’s associate and a new recruit Ashiq of Langate in Kupwara was also killed in the gunfight that started at around 3 am and was over by 11 am. “He (Wani) had some time ago shifted from south (Kashmir) to here. We had the information but wanted to be sure before going for the operation,” said a senior police official. The killing of Wani, who had a bright future ahead of him before he “embraced armed resistance”, is a grim reminder about how the decades old conflict has been consuming young lives in Kashmir. Talking to a local news agency, Wani’s father Bashir Ahmad said his son’s death could be a big achievement for forces but it “means an end to ten months of persecution for them (the family) at hands of forces”. “I would have never asked him (Wani) to surrender. He had chosen his path and he achieved what he wanted to,” said Ahmad, narrating how forces would frequently pick him up and seek explanation why his son picked up gun. 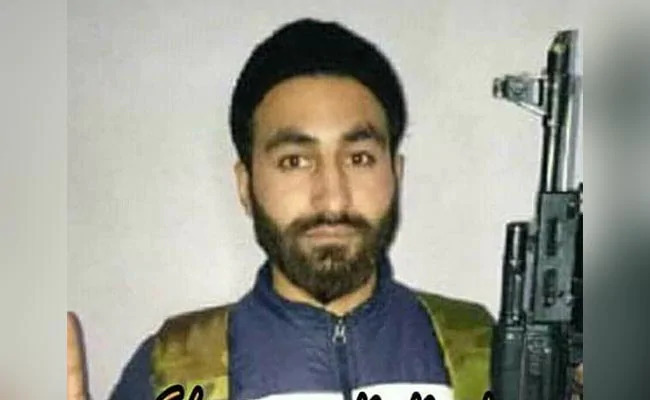 A militant for nine months, Wani according to a senior police official spent most of the time in south Kashmir – the hotbed of Kashmir militancy. Though his name didn’t figure in any attack by militants on forces during this short period Wani remained the most discussed rebel on social media. There were two reasons to it: security establishment was worried that more than the gun Wani’s pen could attract more educated youth into militancy and he could become a role model for Valley’s young. The signs were already there as north Kashmir, where security agencies were able to wipe out local militancy many years ago, had started to witness trickle of youth into rebel ranks. In his two letters which he wrote Wani talked about Kashmir militancy, “state violence, manufactured narratives about Kashmir resistance and its counter, occupation and martyrdom”. Born to a well-off family in Lolab Valley of Kupwara district – his father Bashir Ahmad is a lecturer and younger brother Mubashir an engineer – Wani was pursuing his PhD in applied geology on ‘Structural and Geo-Morphological Study of Lolab Valley, at Aligarh Muslim University (AMU) when he suddenly disappeared in January this year. The suspense was finally over when a photograph appeared in social media in which he was seen holding a gun, announcing his decision to join militancy, his nom de guerre Hamzah Bhai. Stubborn, Wani had spent little time in his native village of Tikipora. After his initial schooling from Jawahar Navodiya Vidayala’s boarding schools at Mansbal and graduating from Kashmir University, he went to AMU in 2011 where he completed his Master’s and MPhil in Geology. A vocal speaker Wani was actively involved in student’s politics at AMU and had written articles on student politics on an online portal, thecompanion.com. In 2016, he received an award for best paper presented at an international conference on ‘Water, Environment, Ecology and Society’. He was the first from his village, around 140-kilometre from Srinagar, to pursue a doctorate. “Those who are developing an antithesis for the weapon wielder using ink let the genesis of my new role be known to them…remember, I was born in the hills and I am back to them again,” Wani penned down his thoughts in his second letter this September. He is one of many highly qualified youth in Kashmir who gave up their luxurious lives to join militant ranks. Earlier this year, an assistant professor from Valley’s Ganderbal district Muhammad Rafi was killed within 40 hours of his joining militancy, in a gunfight in Pulwama district. “Manan Wani’s dignified death, chosen, in his own words, in protest against the undignified occupation, is a matter of grieving, not regret,” wrote senior journalist Mir Hilal. The killing is set to deepen anger on the ground in the region where rebels enjoy local support.“Deeply pained that we lost a budding intellectual and writer like him, fighting for the cause of self-determination,” tweeted Hurriyat leader Mirwaiz Umar Farooq as separatists asked people to observe complete shutdown on Friday to “pay homage” to Wani. The killing evoked reaction from mainstream politicians as well. “Today a PhD scholar chose death over life & was killed in an encounter. His death is entirely our loss as we are losing young educated boys every day,” former chief minister Mehbooba Mufti tweeted. Urging all political parties in the country to “realise the gravity of this situation” Mehbooba asked them to come forward and try to facilitate a solution for Kashmir through dialogue with all stakeholders including Pakistan to end bloodshed. Fearing valley-wide protests by students, authorities had ordered closure of schools and colleges in Srinagar and other places for Friday while internet was snapped in Kupwara and other parts of the Valley. Wani’s body was handed over to his family late Thursday afternoon but not before J&K police and Army closed down all roads leading to Lolab to prevent people from marching towards Tikipora. Even the media wasn’t allowed to cover the funeral. He was laid to rest late Thursday evening. “Till path of martyrs is walked, no corrupt narrative will find its space in Kashmir. The day, the gun is silent, their deceit will succeed,” Wani wrote in his last letter.